Sides and front of toy box are made from 1/2" plywood and top, bottom and back are made from 3/4" stock. 1/4" plywood overlays create 3-D appearance. 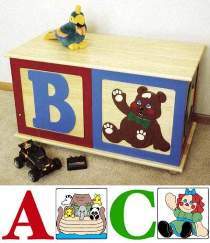 Plan includes FULL SIZE patterns for the letters, the bear, Noah’s Ark, and rag doll. Measures 37"L x 22"H x 19"D. #1046 ABC Toy Box Hardware includes hinges, lid supports, hardware mounting screws and wood ball feet. Project plan, wood and wood finish not included. Special #1053 includes the plan and hardware together at a reduced price.